The last modification to occur to the movement would take place late in production and that is the addition of a groove, which is placed on the outer edge of the movement near the balance wheel. 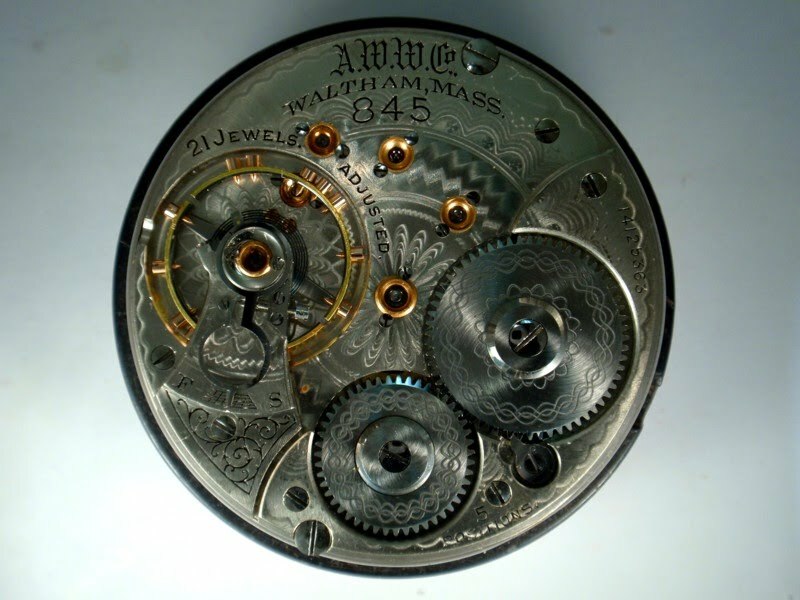 One would assume that its function is to allow the watchmaker to more easily adjust the meantime screws and to sight across the balance wheel to assure that it is true in the flat. The earliest documented occurrence of the Groove is in a curious run of 845s, 14125301-14125400, which is a short run of 100 movements. Two photos and one watch in the possession of the author (seen below) show movements from this run with the Groove. There have been no reports of the Groove in movements from the 15 million range but it does begin to appear sporadically in the 16 millions. Starting with serial number 17065001, it appears with consistency but the author is reluctant at this time to state that it is used exclusively through the end of Model 92 production.